May is National Mental Health Month! To help create awareness, we’ve started a campaign at King’s Schools that we’re calling M.I.N.D. Yo’ HEALTH. Throughout the month, students have many opportunities at school to participate in fun, mental health boosting activities. Each week has a theme and focus with the goal of inspiring students to support their mental health and equipping them with some tools they can use. To kick off the month, we focused on Gratitude and Kindness. Students spent time during lunch creating gratitude banners and giving each other compliment cards. Gratitude is proven to be an amazing way to redirect the brain away from feelings of anxiety and depression and release feel good hormones. It’s a simple but powerful tool!! Family Challenge: Make a point this weekend to share things you are grateful for with each other. A gratitude journal or poster can help the family develop habits around gratitude. Try it out and notice how it changes the atmosphere of your home. Did you know even small amounts of regular exercise can have huge benefits on your overall mental health? Not only does moving your body boost energy, increase dopamine, reduce stress, help you sleep better and work more productively but studies also show people who suffer from anxiety and depression can achieve long-term relief from exercise and its mood boosting benefits! This week the students had the opportunity to do lunchtime activities like going for a walk, doing physical activity challenges, and playing lawn games. 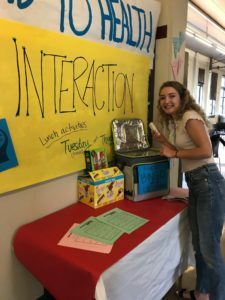 The students were reminded to use their lunchtime as an opportunity to feed their bodies and also MOVE their bodies to boost their ‘happy’ hormones and help their brains refocus for the afternoon. 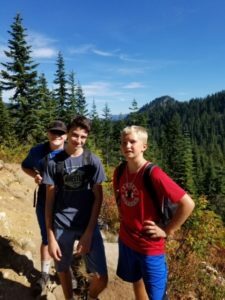 Family Challenge: Go for a walk, bike ride, or hike as a family sometime this weekend. Talk with your teen about their schedule and ask how much physical activity they are getting. If they need more, come up with ways to add in even small amounts of activity to boost their overall mood and productivity. Did you know isolation from other people is one of the most telling red flags when your mental health is needing attention? Most people probably do know that fact so now, flip it! Having quality, positive interactions with others can help boost your mental health and keep you attuned to the world around you. This week we focused on interactions with friends and interactions with family. Both are essential in building positive self-esteem, good communication, empathy, and overall happier feelings. In the survey King’s students took as a school 70% of them said they believe their friends know the “real me.” That’s a great percentage but we encouraged the students to make that number higher. We reminded them that the way we begin to feel known is to open up, be vulnerable, and interact with each other face to face. Family Challenge: Take a few minutes as a family this weekend to assess if the primary interactions happening in your home are positive or negative. Allow every person in the family to voice their opinion. Listen to each other and then come up with ideas of how to increase positive interactions. Make a plan to have fun together on a regular basis! 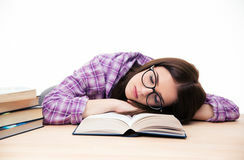 Did you know research shows high school students should be getting 9 hours of sleep each night? 9 hours! EVERY NIGHT! Sadly, the survey data from King’s students told us only 6% of them are getting enough sleep! YIKES! That means only about 38 of our 467 students are rested and at full capacity to learn, grow, and feel their best. 40% of students told us they get between 4-6 hours of sleep on an average night. 80% of students said they do not feel rested when they wake up! Did you also know that “catching up on sleep” over the weekend is actually a myth? Our bodies need a regular, solid sleep pattern to give us the proper support. Sleep plays a major role in how our bodies function, including the ability to produce the energy and hormones needed to maintain a healthy body and positive moods. Maintaining a good sleep pattern should be a top priority at this age, especially if a teen struggles with feeling sad, depressed, unmotivated, or just plain exhausted. This week we quizzed the students through a fun game of trivia to see what they knew about sleep and the important role it plays in their mental health. Family Challenge: Talk with your teen about their sleep patterns. How much sleep are they getting on an average night? Is it enough? What keeps them awake? Research is finding higher correlation rates between teen’s phone usage and lack of sleep. In our survey, 82% of King’s students told us their phone stays in their room all night. Only 13% said there is a designated space outside their room for their phone at night. Our challenge for you is to try having a designated space for your student’s phone at night. Help them learn healthy sleep hygiene practices and see if there are ways to assist them in getting consistent sleep. Did you know teens who spend more than 3 hours on their phones a day are more likely to be depressed and have higher rates of loneliness? Research is repeatedly confirming that teens today are highly addicted to their phones and most will quickly admit to that fact. This generation is more connected than any generation before them but they are also showing skyrocketing rates of mental health concerns like anxiety and depression. Their smartphone might be the primary culprit of their woes. That does not mean they have to give it up completely it just means they need to learn how it affects them and know how and when to disconnect. Students participated in phone challenges to practice disconnecting from their phones. They began by being challenged to go one passing period without checking their phones, the next day go all of lunch without their phones, and finally challenged to end the week with a full phone free day. Family Challenge: Designate time during the week for the whole family to be phone free. Start small with meal times and work up to full evenings or possibly a full weekend day. The whole family should participate and discuss how it feels to be without phones. Make a plan as a family to have ongoing phone free time in your weekly schedules. Take phones out of bedrooms and keep them overnight in a designated space to help ensure disconnection and better sleep. As May ends remember to M.I.N.D. yo’ HEALTH: Move your body, Interact, get good Nightly sleep, and Disconnect from technology regularly!! Jean M. Twenge, iGen: Why Today’s Super-Connected Kids Are Growing Up Less Rebellious, More Tolerant, Less Happy-and Completely Unprepared for Adulthood (New York, NY: Atria Books, 2017). Gregory L. Jantz, Six Steps to Reduce Stress (Carson, CA: Aspire Press, 2016). 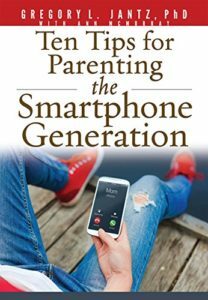 Gregory L. Jantz, Ten Tips for Parenting the Smartphone Generation (Carson, CA: Aspire Press, 2016).